We call our Competition pad for the M&P the “Triple Threat” since it works on three mags — the old-style M&P, new-style M&P, and the SIG 320. We spend a lot of time at matches, bringing home feedback from shooters all over the world. For example, put two factory M&P mags next to each other in a double mag pouch, and you’re guaranteed to snag one on the other eventually. HK’s do the same thing, as does the new SIG 320. At virtually every match we attend, we see shooters grinding the noses off their stock mags to keep this from happening. 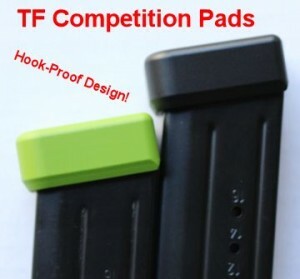 At the same matches, we see people failing to fully seat a magazine, or bobbling a reload thanks in part to that plastic “hook” pushing the magazine’s center of gravity away from the center of your hand. Our “competition” line incorporates a thicker format, flat nose, and an angled rear face, all designed to defeat “hooking loss” and help create a more-effective kit. The flat nose lets the magazine’s center of gravity settle into your palm where it should be. 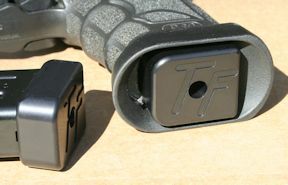 The angled back and flat nose work together, letting the mags slide past each other easily (instead of hooking). Lastly, we machine each basepad to weigh just under one ounce — the maximum allowed in IDPA, and half the allowed “two ounces over stock” in USPSA. That one ounce of weight makes the magazine feel slightly more “neutral” in the hand, and helps the magazine drop clear of the pistol when empty. Our competition basepads work with various magwell systems. This is one of ours for the HK. Taken together, they’re a massive improvement over stock.